The average German newspaper reader knows that Immanuel Kant’s shoes are currently on display in Beijing. “The Art of the Enlightenment” http://www.kunstderaufklaerung.de/ is one of the first exhibitions in the newly opened National Museum on Tiananmen Square, and the 10 million Euro project has become a symbol for the clash between Chinese reality and lofty ideals. The curators of the state galleries of Berlin, Dresden and Munich had more on their minds than just sending their Gainsboroughs and Tischbeins to China. The Age of Enlightenment in 18th century Europe, after all, was the time when philosophers like Kant and Voltaire called on people to trust their own minds more than Church and State. The average Chinese newspaper reader is less likely to have heard about the enlightened German art. And he or she is highly unlikely to have heard that the China expert Tilman Spengler, who had helped design the exhibition, was denied a visa to travel to the opening with foreign minister Guido Westerwelle (a few days before the arrest of the Chinese artist Ai Weiwei). All of this caused commentators in the German media to ask the question: Is the European Enlightenment wasted vis-à-vis Mao Tse-tung’s mausoleum on Tiananmen Square? The Goethe Institute does not give up the search for common ground. Our small group is ushered into the museum through a side entrance. The roughly 20 Chinese visitors have signed up for the guided tour online. Today’s topic: Enlightenment and Education. A German art historian gives a brief introduction into the thinking of Kant and Rousseau. After that, a Chinese employee of the Gallery in Dresden explains how Rousseau’s motto “Back to nature” can be seen in a Gainsborough painting of playing children. The tour guests later gather for a discussion about how to foster children’s creativity and independent thinking in China. Few other visitors can be spotted strolling through the dimly lit rooms. The eyes have to re-adjust to the bright daylight in the lobby of the colossal modern glass and steel structure of the building, which is a merger of the former Chinese Revolutionary Museum and the Chinese History Museum. On this Saturday morning, the crowds are headed towards the hall facing the main entrance. Its walls are painted bright red, large oil canvasses depict Mao Tse-tung in commanding poses and conspiratorial meetings of early Communist groups in Hunan – a special exhibition to celebrate the 90th anniversary of the Chinese Communist party. The biggest attraction, however, awaits the visitors on the far right side of the building: A huge pink screen announces the exhibition about the “Voyages” of Louis Vuitton. In four big halls, it tells the story of the founder of the French luxury brand who started out as a luggage packer for Parisian high-society ladies in the mid-19th century. The company also equipped explorers with sturdy trunks, among them the members of an expedition from Paris to Peking in 1907 or the members of the 1931 Croisiere Jaune, who followed Marco Polo’s route to China. Growing up in Germany, I had thought of Louis Vuitton as the world’s least subtle fashion brand, the status symbol of choice for middle-aged wives of small town lawyers and doctors. 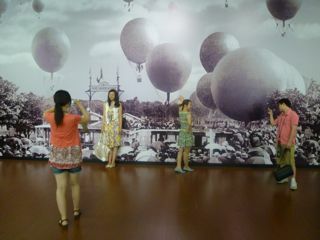 But in today’s China (and all over Asia), “Luyi Weideng” (short: LV) symbolizes youth and glamour. Fashionably dressed and fashionably slim young ladies saunter between the glass showcases and examine the old models of travel bags and trunks with an expert’s eye. The new models need no introduction – they are suspended from the shoulders of the visitors. The juxtaposition of Chairman Mao and LV has led Chinese media to debate if materialism has taken over as the leading ideology in today’s China. One might add: Just like Communism once superseded the ideas of the European Enlightenment, introduced to China by reformers in the early 20th century. 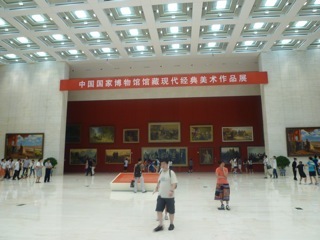 The National Museum has thus captured three stages of China’s development in the last 100 years. For a motto, I would suggest: 启蒙，起来，发财！（Qimeng, qilai, facai!) : Wake up (from ignorance), stand up (for the revolution) – and get rich!